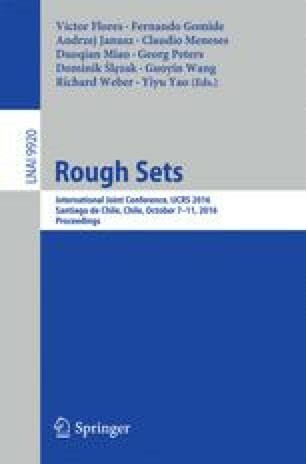 This paper discusses optimistic multigranulation decision-theoretic rough sets in multi-covering space. First, by using the strategy “seeking commonality while preserving difference”, we propose the notion of optimistic multigranulation decision-theoretic rough sets on the basis of Bayesian decision procedure. Then, we investigate some important properties of the model. Finally, we investigate the relationships between the proposed model and other related rough set models. This work was supported by the China National Natural Science Foundation of Youth Science Foundation under Grant No. : 61305052, 61403329, the Key Technology Research and Development Program of Education Bureau of Jiangxi Province of China under Grant No. : GJJ14660, the Key Technology Research and Development Program of Jiangxi Province of China under Grant No. : 20142BBF60010, 20151BBF60071.